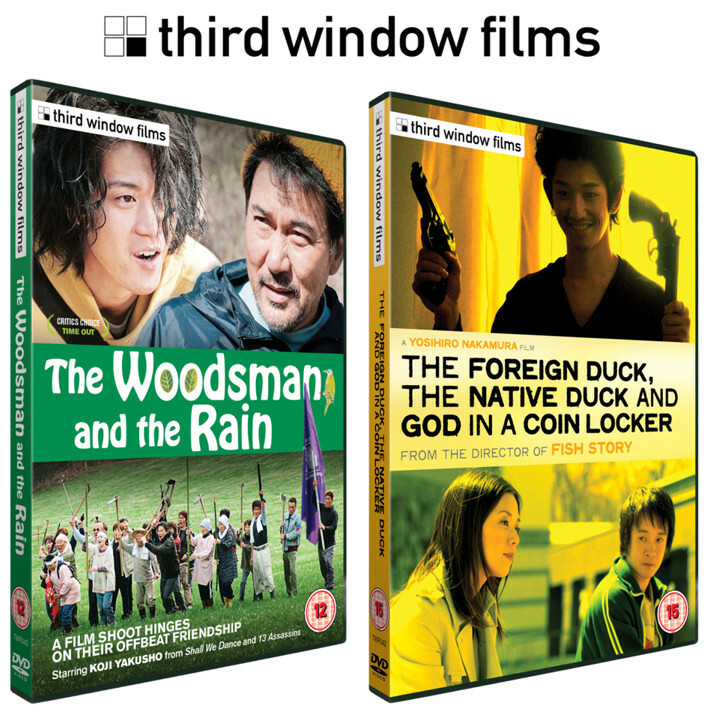 Japan Centre in conjunction with Third Windows Films are running a competition giving you the chance to win a set of 2 fantastic DVDs. Up for grabs we have ‘The Foreign Duck, The Native Duck & God in a Coin Locker’, directed by Yoshihiro Nakamura (Fish Story) and available on DVD from January 14th, as well as ‘The Woodsman & the Rain’ directed by Shuichi Okita, the winner of the Special Jury Prize at the Tokyo Film Festival and available on DVD from January 28th. Both are really excellent Japanese films with great casts and high international acclaim. We have three copies of both films to give away to three competition winners. Check the details below to learn a bit more about the movies and how to enter. Moving into his new apartment in Sendai, college student Shiina meets his new neighbour Kawasaki. Tall, confident Kawasaki and short, mild-mannered Shiina seem to be unlikely candidates for friendship, but they click over a mutual interest in Bob Dylan. This bizarre, existential adventure story is funny, touching and sad at the same time. Screening at the 2012 Toronto Reel Asian International Film Festival, The Woodsman and the Rain is a very sweet and funny film focusing on the unlikely friendship of Katsu (Koji Yakusho) and Koichi (Shun Oguri). Katsu (internationally acclaimed actor Koji Yakusho from Shall We Dance and 13 Assassins) plays a 60 year-old lumberjack who lives in a small village in the mountains. When a film crew suddenly arrives to shoot a zombie movie, Katsu finds himself unwittingly roped into assisting the production and becomes increasingly frustrated with the pushy crew, especially the young, seemingly spineless director Koichi (Shun Oguri, star of Crows 0, Sukiyaki Western Django and Space Brothers). To enter this competition, simply leave a comment on this post or tweet us @JapanCentre with hastag #competition telling us which Japanese movie character or star you would love to meet! We will choose a random winner from everyone who leaves a comment and let you know whether you have been chosen by Thursday, January 24 2013. Good luck everyone and watch out for our next Japan Centre competition! Posted in Uncategorized and tagged competition, Japanese Films. Bookmark the permalink. Haruo Nakajima – love to know what he thought of it all and what he was doing!! I’d love to meet Nana (played by Mika Nakashima). She’s just so cool! Has to beTakeshi Kitano. Hanabi is a must-see, Kikujiro also good. For me it would have to be Nobuko Myamato as the eponymous Tampopo, I want to make the perfect ramen. Riisa Naka (^_^) !!! She has an amazing persona and loved her performance in ‘Time Traveller’ ! No doubt on my mind, it has to be a Ghibli character, and I would say Nausicaa, a true humble hero, aven though my husband is very much in love with her, maybe she can bring along her meheve and teach us to fly on it…oh, and the fox-squirrell too! Would love to meet Godzilla, what do you mean he’s not real? L from Death Note. I admire his dedication to お菓子. Would love too meet Hikari Mitsushima, always plays such cute characters! Hikari Mitsushima, her character was so cute in Kakera. I’d love to hang out with Momoko and Ichigo from Kamikaze Girls…crazy things would be sure to happen! Uchida Shungicu. I really like her manga too. Totoro would be e one for me, under the umbrella in the rain. My daughter and I love that scene. Totoro is so old yet he experiences things as if it is the first time. DVD Competition:- Ryoko Yonekura is accomplished on screen and broadway, would be first choice for a chat, especially after watching the rather quirky Doctor X.
I’d love to have a ride on the Cat Bus in My Neighbour Totoro! I love cats, and this seems like such a cool way to get around! Takeshi Kitano indeed. I have always wanted to meet him. I would love to meet Hachikō, the amazing dog from the movie of the same name! I’d like to dine with the star-crossed couple from ‘Tampopo’. I’d love to meet Shion Sono. He’s probably my favourite director and I’d love discuss his methods of production. I think it would be cool to meet Abe Hiroshi or Shintaro Morimoto, or any of the awesome voice actors for the animes that I love. Hiroshi Abe, I actually saw him in London last year! Has to be Totoro. I want to ride in that cat bus! Would love to meet Tadanobu Asano, especially as Hattori Genosuke. Enjoy the quiet intensity and subtle expressivity he brings to his tragic character in the film. Kenichi Matsuyama. He was brilliant in Death Note and Norwegian woods!! Also he is such a babe.